I graduated from medical school this past week. Thank you to everyone who supported me along the way and congratulated me at the conclusion. And, thanks to you readers for being there along the journey, hopefully learning a bit when I fell and laughing with me when I rose again. As for my absence from this blog, it's easily explained: fourth year! I was fortunate enough to get some time off after match day and travel. I spent several weeks in India, visiting family all over Rajasthan and Maharashtra, including my 88 year old grandmother. After seeing my relatives, I met up with a few friends from med school in Delhi to fly to Nepal and go trekking in the Himalayas. We spent a few days in Kathmandu (the capital of Nepal) and then took a 6 hour bus ride to Pokhara, the second largest city in Nepal, which is located in the Annapurna region of the Himalayas in western Nepal. 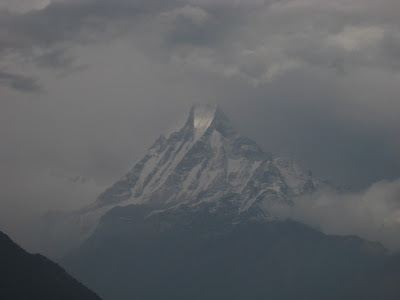 From Pokhara, we began a 10 day trek through the Annapurna region, ending at the Annapurna Base Camp. Words cannot describe the vistas we saw, and I believe everyone in the group has memories that will last a lifetime. After returning, I spent a week in California, finding an apartment, and then returned home. Graduation itself was great. Everyone was excited, catching up on all their senior spring adventures and talking about the future. I think our graduation ceremony was fairly standard. There were speeches by our President and Deans, followed by our keynote speaker. Subsequently, the degrees were conferred by the President, after which we had the procession during which we were hooded by selected faculty members, and then walked across the stage to receive our diploma from our President. I forget the order a bit here, but I think after we all had our diplomas, we rose to take the Hippocratic Oath. That I will exercise my profession solely for the cure of my patients, and will give no drug, perform no operation, for a criminal purpose, even if solicited; far less suggest it. That whatsoever I shall see or hear of the lives of men which is not fitting to be spoken, I will keep inviolably secret. These things I do swear. And now, should I be true to this, my oath, may prosperity and good repute ever be mine; the opposite, should I prove myself forsworn. After the ceremony, everyone gathered in the lobby, reuniting with family and friends to celebrate the occasion. Since then, I have been busy packing and preparing to move. Along with those preparations, I am considering the future direction of this blog. I have enjoyed working on it and developing to this point, and think I shall I continue to contribute to it. However, I am weighing several options about to how to proceed. Any comments with ideas or suggestions would be more than welcome. I hope this blog has been beneficial to you, the reader, and I thank you again for your support along the way. Hey.. you were in India..and that too Rajasthan.. cool! Did u visit Jodhpur? The trip sounds like a really good one. Do keep updating the blog and good luck with the residency! Congratulations on your graduation. I hope you have successfully memorized your oath, and are placed in a great residency program. Remember to always stay dedicated and keep the patients interest at heart. @Arps: Yes, I was in Rajasthan for a few days, and did visit Jodhpur, along with Jaisalmer, Mount Abu, and Udaipur. I had a great time, although it was unbelievably hot as usual.